And as parents, they seem to come a dime a dozen. Gifts from friends, holiday presents, smooshed into Happy Meals, won at local carnivals. Stuffed animals, blocks, electronics and so much more flood our houses. I’d venture to say that many of the toys today aren’t made to last. They are made to be mass-produced, so they break, fade and generally are not interesting enough to hold a child’s attention for very long. And then I met BigJigs. BigJigs Toys is a company that was established in the UK in 1985, and has finally hopped the pond to make their awesome toys available to American families. A throwback to a time when quality came before quanitity, BigJigs toys are solid wooden toy sets aimed to last. 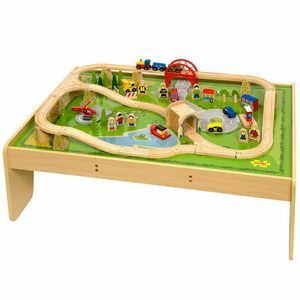 From train sets to heritage play sets, BigJigs Toys offer an abundance of imaginative play opportunities for kids of all ages! That table has withstood all of her 26 pounds! 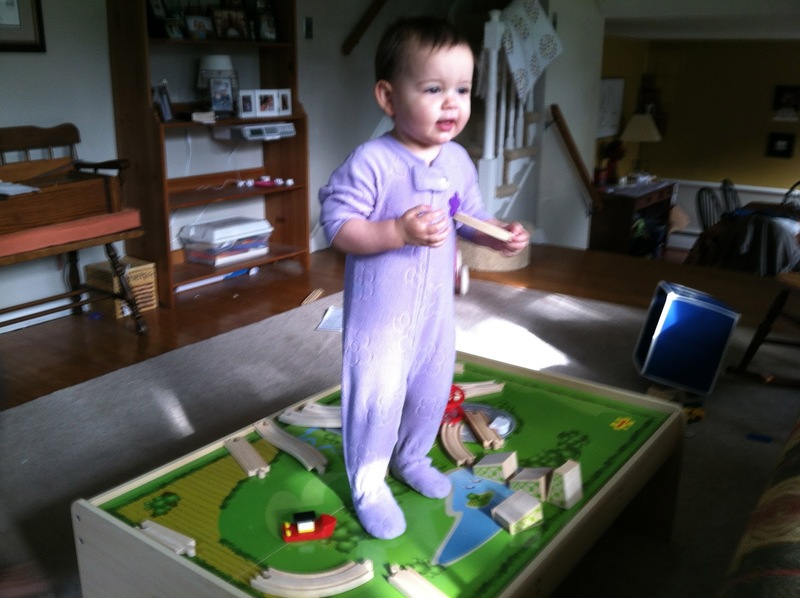 With the wear and tear my kids put toys through, it is clear that I will be able to keep this Train Table (and all the cute accessories) for my grandkids. I love thinking of BigJigs Toys not as a purchase, but as an investment for future generations! I’m not much of a toy assembler (unless it’s an emergency), but as soon as the BigJigs package arrived, my husband got right to work. 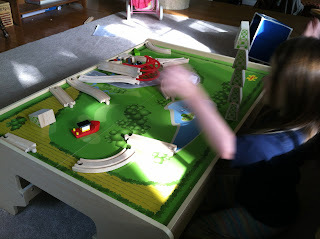 I thought, with all the intricate pieces, it would take hours for the Train Table to be ready for play. 20 minutes after he started, Hubby was scooting trains and helicopters around the track, my preschooler in awe next to him. I said before that many toys on the market right now don’t leave enough to a child’s imagination. They get easily bored (if the toy hasn’t been damaged already). Each and every play set that BigJigs creates has endless possibilities for play. 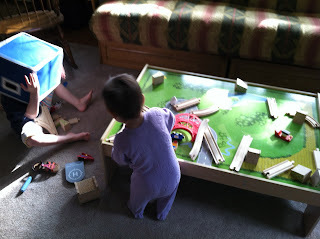 Chica, my almost 4 year old, tons of time with the Train Table and Play Set. Sometimes, she creates fun train tracks and lines all the cars up. Othertimes, she takes the people and plays Town with them. Sometimes she takes the wooden pieces and sees how tall she can stack them. Every day it’s something new. I love how her creativity is challenged to think big! Chica is obviously the perfect age for BigJigs Toys. But I wasn’t sure how my 16-month old would like it. I was happy to learn that safety is a top priority for BigJigs, and all of their toys go through rigorous testing to meet and exceed all safety standards. Also? There is not one choking hazard in the entire set! I don’t have to worry about the my 16-month old popping a small piece into her mouth. Both girls can play (safely) with every part. I am thoroughly impressed with all of the product BigJigs creates. 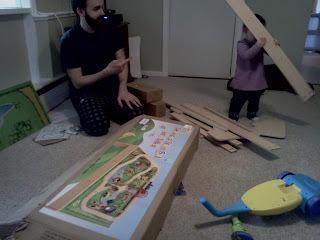 And I look forward to adding more playsets to our toy repertoire! With Summer rolling around, it is a great time to check out BigJigs Toys for graduation gifts, Summer birthdays, or even to get ahead for the holidays. You can find out more on the BigJigs Website, as well as connect with them on Facebook. 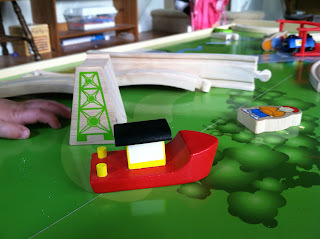 Have you ever bought or received a BigJigs playset? What did you think?